Healthy meals delivered to your home would make dieting so easy! Fresh food is so important especially when we are dieting. Now you can enter to win in the Fresh Diet giveaway and have healthy meals delivered to your home! 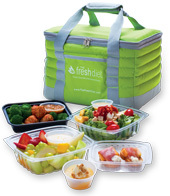 The Fresh Diet delivers fresh, healthy meals to your door. The meals are delivered daily at select locations or twice weekly. The gourmet meals are calorie controlled and nutritionally balanced. They provide breakfast, lunch, dinner and two snacks which you select from the choices available each day. The Fresh Diet makes eating fresh, healthy meals convenient and delicious. Read Gator Mommy Review’s The Fresh Diet Review. One lucky winner will receive a week of The Fresh Diet meals delivered! I would like to win this prize to have opportunity and convenience and healthy treat of week’s worth of nice meals delivered to me. Since I’m nearing 50 years old I notice I can still eat the same but I put on weight anyway after years of maintaining the same weight. I admit I need help here and would love to get my old self esteem back. Thanks for that opportunity! 1 I need to lose weight, 2 I live on a fixed income and any help with the food budget is appreciated and 3 I don’t really like to cook. This would be for my husband. He’s trying to eat healthier to lose some weight but is struggling. I have been wanting to try this for sometime. i actually got $25 off, but could not afford to use it because the meals for 4 were some what expensive at the time. this is a great prize.and i would love to win!!! I would love to try the meals. I am interested in the meals. This would be so awesome since my crazy busy job and schedule make it difficult for me to cook as often as i would like! I’d love to win for my aunt. We just lost my grandmother and my mom in a two week span. She is now all alone in a big house. I think it would be a comfort for her to not have to adjust to cooking for one so quickly. I want to lose some weight and I’m always saying, “If I had someone making my meals I lose a lot of weight”. Let’s see if I would. This would be great for myself and not having to prepare my meals for a whole week.I currently am on a diet but usually skip a meal or 2 a day because i can never find the time in my day to prepare a nutritionally balanced meal. I have been looking at different diet programs and this would be great to try out before I commit a lot of money. Wow this giveaway is so perfect it would really e amazing to win especially since i keep trying to get my mom to eat more healthy and get out of bed. I would like to win this prize because I want to lose some weight. This would be so convenient. I like that the meals are alreday packaged the way you are supposed to eat them. My problem is that I am lazy and don’t cook, plus a I need to lose 30 pounds. I would like to win because with both my husband and me working, we often grab take out or eat convenience foods after working late. This would really help us eat healthier! I would like to try the meals to see how it works. I am working hard at losing weight and this seems like something I would like to try. I would like to win this for my sister in law, she is always looking for ways to loose weight and eat less calories, i think this would help her to get some ideas what she should be eating.